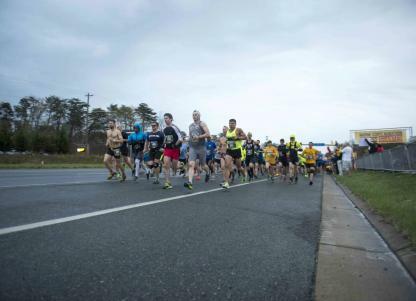 The Marine Corps 17.75K offers guaranteed access to the MCM for all finishers. Run 11.03 miles through Prince William Forest Park and earn "Access Granted" for a guaranteed spot in the MCM. Thank you runners! Registration to run the Marine Corps 17.75K is now closed. The Marine Corps 17.75K offers guaranteed access to the MCM for all finishers 14 years of age and older on MCM day. 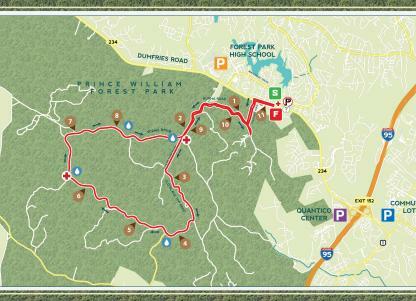 Run 11.03 miles through Prince William Forest Park and earn "Access Granted" for a guaranteed spot in the MCM. Immediately following the event after results are posted, all finishers will receive an email with a dedicated link to the online registration form for the 44th MCM. This link may only be used by the registered runner who completed the 17.75K. Registration with the Guaranteed Access link must be completed by 12:00 p.m. (noon) eastern time, Tuesday, March 26. Runners who wish to share the Access Granted entry with another individual must first register for the MCM using Access Granted, then initiate a transfer. The transfer fee is $50. Transfers will be available beginning at 1 p.m. on March 26. When transfering, the registered runner will not receive a refund of the original fee. Any monetary transactions associated with registration fees must be handled directly between the runners. After registering for the Marine Corps 17.75K, some runners unfortunately are unable to participate. These runners may opt to transfer their entry to a non-registered runner through the Transfer Program. The MCM doesn't assist in the identification of individuals to receive a transfer. Runners often find transfer partners on the MCM Facebook page. Runners currently registered for the 17.75K may transfer an entry to another runner. There is a $25 transfer fee (plus processing) associated with transferring between individuals. Either individual involved in the transfer may pay this fee. The MCM Motivational Dinner Series presented by KPMG, hosted aboard Marine Corps Base Quantico, will be held on three evenings throughout the year offering runners, guests and the community the opportunity to dine where Marines dine, receive inspiration from accomplished U.S. Marine athletes, and engage in military camaraderie with fellow runners while enjoying a delicious pasta dinner at the Clubs at Quantico. Each dinner will feature the Marine Corps Base Quantico Ceremonial Platoon providing colors with the Quantico Marine Band playing the National Anthem and traditional Sousa marches. The menu features multiple pasta options and sauces, healthy salads and warm cookies for only $20 (+processing fee) per person. While the dinners will be held on the eve prior to scheduled MCM Event Series runs, participation in these events isn’t required to purchase tickets. The dinner series kicks off on March 22 at 6:30 p.m. on the eve of the Marine Corps 17.75K and features Colonel William C. Bentley, III, as the guest speaker. Col. Bentley, the Commander of Marine Corps Base Quantico, graduated from The Citadel in May 1991 and commissioned through the Platoon Leaders Class. As a CH-53E helicopter pilot, he deployed to Europe, Africa, the Middle East and South America and commanded Marine Heavy Helicopter Squadron 464. Additionally, he served at the Naval Air Systems Command, US European Command and Office of Naval Research, and earned a Masters degree from the National War College. He assumed command of Marine Corps Base Quantico in July 2018. In addition to a distinguished military career, Col. Bentley is an accomplished athlete with a lifetime commitment to health and fitness. He grew up playing a variety of sports through high school including baseball, softball, basketball, soccer, football and wrestling. In college, he played football, participated in various intramurals, and was on the boxing team. In the last 25 years, he has completed over 50 races including six iron distance triathlons and nine marathons, including eight Marine Corps Marathons." A wide variety of volunteer positions will be available offering numerous ways for individuals and groups to support event day. Opportunities for Marine Corps 17.75K volunteer registration is now open.